Brushing your teeth twice a day, for two minutes each time. Ask our dentist which type of toothbrush is best for you, as many of us use brushes that are too hard or too large. 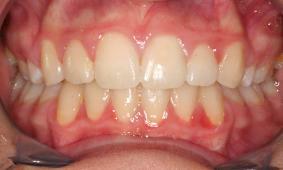 Flossing your teeth, as a toothbrush cannot reach into the gaps in between the teeth or below the gum line. Making sure you do not brush your teeth too hard as this can damage your gums; ask our dentist or hygienist to show you the correct technique. You do need to brush at least twice a day. The best time to brush is first thing in the morning and last thing at night. Aim to spend at least two minutes brushing your teeth or about 30 seconds on each quarter or quadrant. Hold your toothbrush at a 45° angle when brushing the outside and inside surfaces of your teeth as this will help your toothbrush reach right down to and just below the gum line. 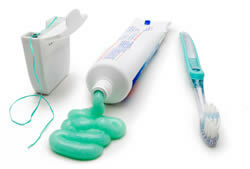 Don’t forget to thoroughly brush the chewing surfaces of your teeth before moving onto the next section of your mouth. A great brushing and flossing routine will only take you a few minutes and will remove the daily build-up of plaque. If the daily build-up of plaque is not removed this can lead to the first stages of gum disease, which is called ‘Gingivitis or the damage to the tooth surface leading to dental decay. You do need to floss once-a-day. Try to floss last thing at night so you go to bed with a clean mouth. To floss properly you need a piece of floss of about 45 cm in length. Wind the ends around your middle fingers and use your thumb and forefinger to manipulate the floss so you can slide it right down to just below the gum line in between each tooth. Wrap the floss around the tooth and slide it gently up and down to remove the maximum amount of plaque. Use a fresh section of floss for each tooth. If you have difficulty flossing then please ask us for a quick demonstration or we can also chat to you about alternative tools to use including soft picks and interdental brushes.